The great celebratory cycle of our Church is now complete, as we gathered together last week to celebrate the coming of the Holy Spirit at Pentecost. And now, just a short week later, we turn our gaze towards the countless men and women on the walls of our Churches that had flesh just like ours, who experienced the same types of joy and grief that we experience, and who had to deal with the same difficulties of an earthly life. In everything that they are, they are completely like us…and yet we learn from reading their lives, that they seem so completely different. How many stories and miracles have we read about throughout Scripture and throughout the history of the Church about the Saints, that have made our mouths drop? How many tremendous and incredible feats have they been able to accomplish because of the power of the Holy Spirit coursing through their veins? We read these stories and sometimes feel as if we are reading about fairy tales and miracles that are only performed by God through a chosen few. How do these men and women get to the point that they could, as the savior said, “move and cast mountains into the sea?” How did a simple man in Moses, have the ability to divide the waters of the Sea? How did he take and smash an ordinary rock, creating a stream of water out of nothing in order to quench the thirst of his people? How can St. Mary of Egypt, a harlot and a prostitute of proportions that even the worst kind of modern day filth would look tame in comparison, cross over the rivers of the Jordan as if it were like walking over the sandy dessert? Or even centuries later…closer to our own modern day…how could a simple monk in St. Herman of Alaska, stop a raging forest fire from engulfing an entire village by his prayers…or stop a tidal wave from over taking the shores of his island by simply praying in front of an icon of the Theotokos and of our Lord on the beach? How many of us have ever come into contact with a truly saintly person? I promise you that if you spend enough time visiting monasteries throughout the country, and more so throughout the world, it is not difficult to find living saints. You will know it when you first come near them! There are those who walk this earth that have so much of the Holy Spirit bubbling inside of them, that it radiates out into the air…piercing the hearts of those who come physically close to them! It’s a palpable feeling when you come near holiness…and it’s one that you all will have the opportunity to experience in just a few short weeks, when we have a miraculous weeping icon right here in the Church. All of these incredible men and women, full of the overflowing grace of the Holy Spirit, living lives that are completely holy. There is this temptation that surrounds us to think, that surely these men and women are made from a different mold than you or I! St. Herman can stop tidal waves, yet I can’t stop the overflowing coffee pot from making a mess on my kitchen floor! But we learn something quite striking on the day that we were brought into the Church, and first infused with that same Holy Spirit that the Saints radiate in their lives. “Make them a child of light and heirs to Thy Kingdom” That’s us! “Fill the with the power of the Holy Spirit, that They may no more be children of the body, but children of Thy Kingdom.” That’s us! “Having preserved the gift of the Holy Spirit, and increased the measure of Grace committed unto them, grant that they may receive the praise of their high calling, and be numbered with the first born whose names are written in heaven.” That’s us! To be a saint isn’t some exceptional state to which some are called. It is the NORMAL GROWTH AND FLOWERING of the life that we receive at Holy Baptism! The same abilities that the Saints possess…this same catalyst of the Holy Spirit to perform miracles that go beyond nature…is within each and every one of us! We are all called to greatness…so why can’t we be great?! We talked about the answer to that question this past week at our Metanoia class. There is a word that I want everyone to learn and be made aware of this morning. If we can imagine this power and Grace of God that the Saints have as a rushing river of water coursing through our lives…then this word would be the dam which blocks the Holy Spirit from springing out into the world from us. The word is “Philavtia”. It is a Greek word which the fathers use to describe “Self love”. All of us suffer from this horrible condition, brothers and sisters in Christ. Our focus in this world, and society as a whole is filled to the brim with Philavtia:”Do what you want to do. Be what you want to be! “If you want to be a cat…be a cat!” “If you want to eat 20 burgers a day…we will give you a deal on it!” “If you want to Cherry Pick the Gospel and Christianity, deciding, “well, I believe what the bible says about this…but not what the bible says about that…”…we will find a church for you!” How often have we heard the now famous phrase with horrible grammar: “Hey…you do you…and let me do me”! This is our society, and the chaos of Philavtia that we are now living in brothers and sisters! We are bombarded by this day after day in our society…and even those who faithfully do attend Church, who do have a strong prayer life, who do try to fast and bring God into their lives…every one of us is affected by some measure of Philavtia. We too often love ourselves more than God. And when a human being becomes too full of themselves…there is no room for the power of the Holy Spirit to grow within them. 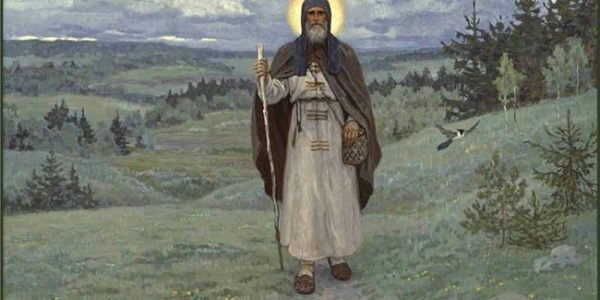 What makes a saint a saint? Their ability to break the dam of “Self Love”, and allow the flowing waters of the Holy Spirit to burst forth into their lives. Saints are those who were able to deny themselves, and to dig out the cross of philavtia from the rich soil of their hearts, put it on their shoulders, and bear it as they followed Christ and the Church. We all have that ability as well! We were all given the same river of the Holy Spirit within us in the earliest stages of our paths towards becoming life God. Our world is becoming a confusing and backwards place, full of the very sentiment which drives mankind from the Love that God shows for us. It is up to us, in our own individual lives, to weed out Philavtia from our hearts, through our prayers, through our humility, and through love shown to each other. Let us go forth and teach our children, through our own example, of what it means to live a life of sacrifice and humility, not only shown to our brother and sisters, but to the face of our merciful and loving Lord.